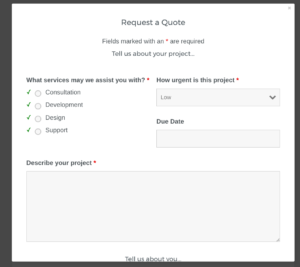 Want to get customer feedback using a WordPress plugin? It can be hard to find a good recommendation, many feedback plugins are out of date or poorly reviewed. This article will focus on free, maintained, well reviewed plugins for collecting feedback. Suggestions and survey responses from our site visitors can provide valuable insight into how we can improve our businesses. It can be difficult to get visitors to fill out surveys, which is why it’s important to craft the right type of question and show it at the right time. What type of feedback can you collect? For example, show a “How did you hear about us?” survey on an internal site page, and find out which marketing channels are working well. You can also create a “Is anything missing from this page?” popup to find out how you can improve your site design and copy. A “What prevented you from purchasing today?” exit-intent popup on your checkout page can help you figure out how to improve your conversion rate. 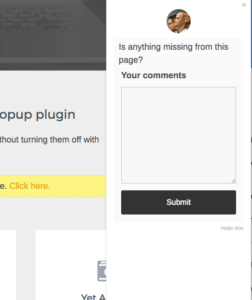 Using a popup plugin along with a form plugin, you can get any type of feedback you’re looking for. Ninja Forms is a free forms plugin, and Holler Box is a free popup plugin. Together, they can help you create surveys and questionnaires to gather feedback. The first thing you need to do is create your feedback form. Activate and install Ninja Forms by going to Plugins => Add New in your WordPress admin. Search for Ninja Forms, install and activate. Visit the Ninja Forms menu item, and click Add New. Choose a blank form and add your fields. What should the form look like? 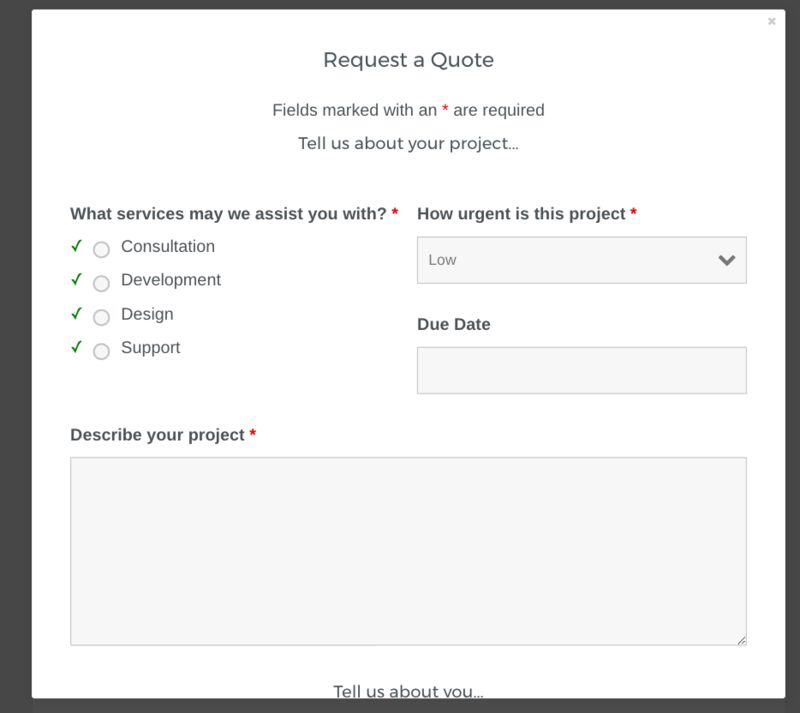 Depending on the type of feedback you want, you can add text, radio, select, or other fields. The idea is to keep it brief so that your visitors don’t abandon the form before filling it out. For many feedback forms, a simple question with one open text field will get you the best results. Multiple-choice forms can limit responses to only what you think they will be, which can cause you to miss out on the really good open feedback you’ll get with a text field. 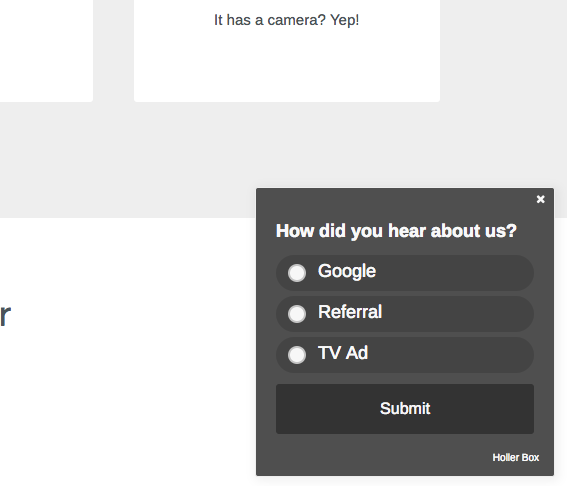 Other feedback forms like “How did you hear about us?” can get away with a simple multiple choice using radio buttons. If you aren’t familiar with how to create a form with Ninja Forms, this video will help. Once your form is complete, save it. 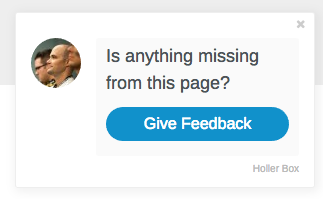 At this point you can simply add your feedback form to a page. If you’d like more advanced placement, use a popup plugin like Holler Box. Install and activate Holler Box in your WordPress admin under Plugins => Add New, search for Holler Box. Activate, then visit the Holler Box menu item and click Add New. Create your popup as desired, then add a Ninja Forms shortcode to display the form in the popup. That’s the basics, let’s look at few examples. 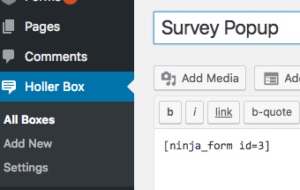 To create a small survey popup like the one pictured, create a Ninja Form with a Radio List. 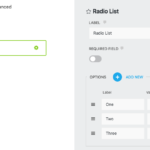 Customize the radio options and other form fields as necessary, then publish the form. 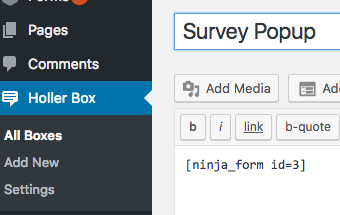 Next, create a new Holler Box, and add your Ninja Form shortcode to the box. 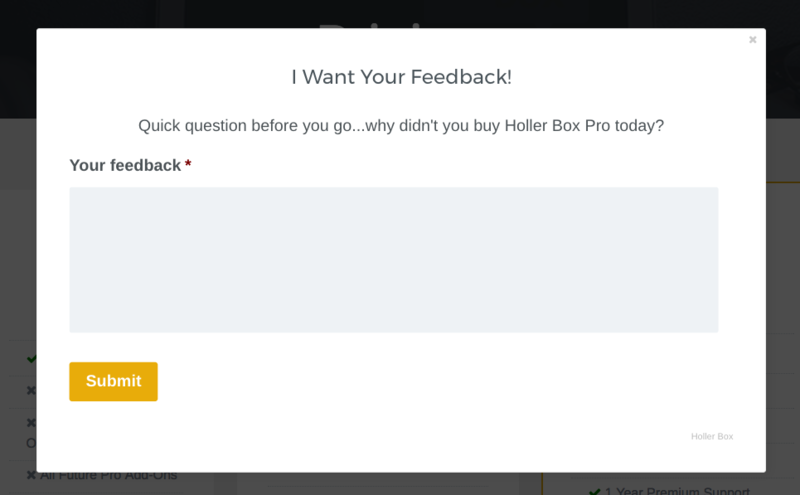 The Holler Box settings should be the default Notification Box type, you can choose in the advanced settings what pages you’d like it to display on. This will create a small survey popup that you can use to gather feedback from your site visitors without interrupting them. A popup that you show only when a visitor starts to exit your page is a great way to get certain types of feedback. For example, you can have an exit-intent popup on your checkout page that asks why they didn’t purchase, or offers them a limited time coupon. You can also use exit-intent as a last ditch effort to get someone to sign up for your email list before leaving. To setup this type of popup, create a new Holler Box and add your Ninja Form shortcode. 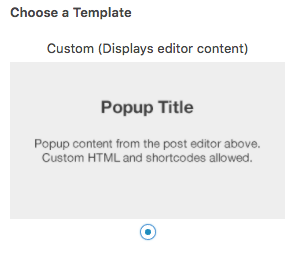 Choose “Popup” as the box type, then choose the custom template. Under advanced settings, select which page you want it to display. 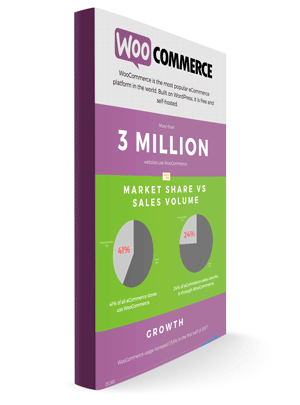 For example, you could choose your pricing or checkout page to collect feedback from potential lost sales. Customize the other options as necessary, and publish to start collecting feedback. The action of clicking a button to display the form engages the user so they are more interested in filling out your form. You could use this for a quote request, ask “Is anything missing on this page?”, and more. To create this type of form, create a new Holler Box, and choose “Popout” as the type. Scroll all the way down to the Popout meta box, then add your Ninja Form shortcode. Configure where you want it to display under the advanced settings, and publish. The last type of form we’ll look at is clicking a link to open your form in a modal window. This can be useful if you have a long form and you don’t want to take up valuable space on your page to display it. For this type of form, you’ll need the Content Upgrade feature available in Holler Box Pro. Create a new Holler Box, select Popup as the type, along with the custom template. 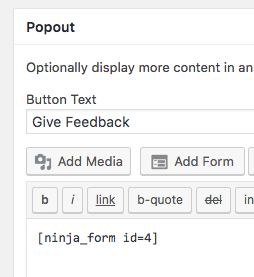 Add you Ninja Forms shortcode to the editor, the same as you’ve done for the other boxes. Copy the shortcode and paste it into the page where you want your link. Edit the display text as necessary. Now your site visitors can fill out your form in a nice modal when they click your link. Ninja Forms and Holler Box are two free WordPress plugins that work great for collecting feedback. 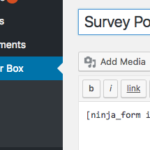 Using the powerful form builder in Ninja Forms, along with the customizable popup modals in Holler Box, you can start getting more form submissions than ever before.